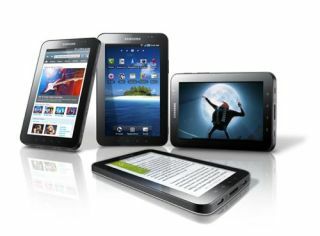 7Digital has announced a link-up with Samsung, which will see it become the primary music service for the Galaxy Tab. At an event in London, Ben Drury of 7Digitial announced that it had teamed up with Samsung on its tablet device, but did note that it would be available on other Samsung devices soon. "I believe [the Samsung Tab] is genuinely a contender against the iPad, but at the same time different," he explained. "We're now working with Samsung to provide [7Digital] on other devices besides tablets." 7Digital also announced it will be available on the Toshiba Folio (an entry level tablet device) and the service will also be O2's digital music partner in the UK. At the event, Dury also announced it has created a mobile friendly store which uses HTML5 (m.7digital.com) and he also showed off the 7Digital Android application, which will offer wireless synching to begin with and music streaming in the near future. This isn't the first mobile app 7Digital has released. In October last year, the company unveiled its BlackBerry application, which it said was key to launching in the US. The UK-based music service has gone from strength to strength of late. In 2009, it was announced that HMV bought up 50 per cent of the company for £7.7 million.